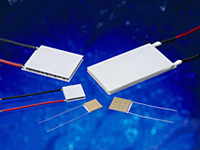 KELK's Thermo-Module (peltier element) is proven by abundant experiences of application products in wide business field as well as individual modules and its cost performance and reliability is highly valued. Mainly for laser diode of optical communication, the micro-module is a best module for temperature control of small parts in relatively small heat absorption. 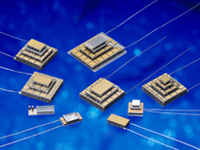 We are proud that our micro modules have the highest quality and efficiency, since the elements are made from our proprietary world's highest performance hot-forged material, and all micro modules are assembled by automatic robots. 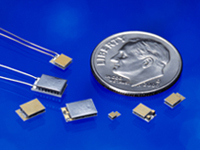 All micro modules are Telcordia- and RoHS-compliant. Custom designs are available. We can propose the optimal design based on our extensive experience. *Please contact us, if your desired performance diagram does not exist in the table. The module which is smaller than micro-module is developed according to the demand of downsizing in recent year. All products comply with Telcordia standards. All products are Pb free. 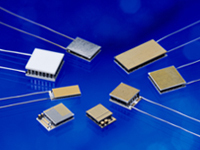 As for sizes, current specifications, heat absorptions and various solder coatings, various customizing is also available. Multi-purpose module is for the usage of large-scale and large heat absorption such as a infrared sensors, lasers and physical and chemical appliances. A standard multi-purpose module uses melt-grown material, and When large temperature difference (ΔT) than usual and low power consumption are necessary, the use of a high performance hot-forged material is available. Also Pb free module is available. Multi-stage modules are used for applications which need the temperature under freezing point such as CCD, optical sensor and etc. Multi-stage module enable it to make a lager temperature difference (ΔT) by overlapping stage of modules. A lower temperature can be produced by using efficient hot-forged elements.